I just completed my first project from the new weld shop, a weight bracket. And the 4410 with the box blade showing an afternoon's work. Frank. I like the weight bracket! Whats that weighing in at? hardwood, nice job on the counterweights. Is that a metal brake in pic #13? How is it working out for you? The shop looks good. Belimki and Dave, Thanks for the compliment on the weight bracket. There are 14 of those little Deere front end weights for the 4000 series. I think they weigh about 45 lbs. plus the weight of the bracket. Weights and the bracket combined are roughly 670 lbs. I just got the box and pan brake set up and really haven't had time to try it out yet. My next project is belly mount hydraulic system running off the mid PTO to operate orbit motors on grain bins. I plan to make a fluid resorvor kind of shaped to fit under the tractor out of sheet steel, so that should give me a test to see if I have any idea how to operate the brake. Frank. Two suggestions for you on your proposed hydraulic system though if I may. First make your fluid reservoir out of heavier material, it will dissipate heat better, and will be easier to work with. Mounting brackets, welded in fittings, etc., are much easier and usually leak less with thicker wall material. Secondly, if you make the reservoir in such a way that you can hang it from the 3pth, it saves you having to pick it up and set it down when not in use. You will also have room for more capacity than if it was underslung, and of course more fluid means the temperature will be lower since there will be more heat transfer. I think if you set it up just right you might be able to just back up over the pump, hitch the tank up, lift the pump into place and go. It might be easier to mount the pump at the front and run a drive shaft to it, it would make removing the pump when not in use a LOT easier than trying to belly mount it. I can tell you must not sleep too much at night, I know the feeling. My bride tells me that the little hampster I have running in my head (on the wheel of never ending projects) keeps me up at night. Looks to me like you are keeping yourself very buisy. Looks good too. Keep the ideas flowing, it will keep you out of trouble. Murf and Tom, Murf, thanks for the compliment on the bracket. Your idea on the 3pt. mount of the tank got the rusty wheels turning again. Maybe mount just the pump under the tractor and leave it there then slide the universal joint off the mid PTO when not in use. I've got some high capacity 3/4 quick couplers that could easily be unhooked from the pump to take the tank and valve system off the 3pt. Tom, you're right some of my best brainstorms occur at 2 AM. Not every one of my ideas has worked to perfection, but I don't plan to quit trying. Frank. 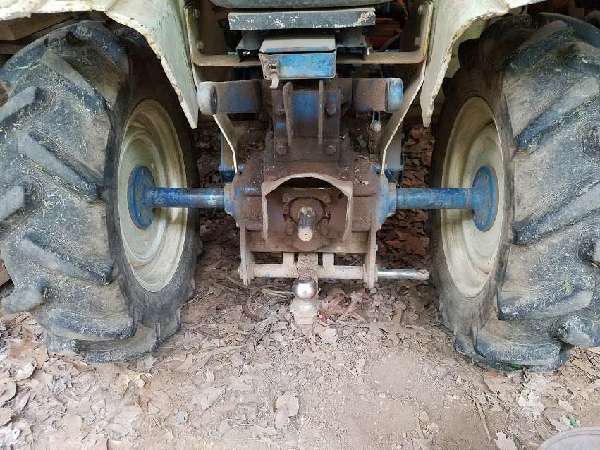 Frank, it might be easier to mount the pump under the front end of the tractor, use a shaft running in a set of carrier bearings and have a splined sleeve which slides back & forth along the shaft forming a sort of clutch to make the pump turn or not. If the shaft and sleeve were the same spline as the mid-PTO shaft it would be fairly easy to do. If you wanted to get really fancy you could come up with some sort of lever to act like a clutch fork and slide the sleeve without even getting underneath the tractor. I suspect that you're going to need a lot more than a 3/4" quick coupler to get enough flow on the return line, although I suppose you could always run 3 line sets & connectors, 1 for the pressure side and 2 for the return, as long as they each had a big line from the motor to the tank so it wouldn't cavitate. Another idea would be to make the pump & tank into one 3PTH-mounted unit. You could then use something like a stout timing chain from a big V-8 engine to increase the PTO speed so that the tractor would just have to run at a high idle and still spin the pump fast enough. The pump won't take much power relative to what the tractor can produce even at just idle. Might make life easier being able to pick up everything at once. Food for the little grey cells. Murf, thanks for your intrest and input toward my next shop project. the pump I have on hand is rated 15 gpm at 2000 rpm. And after thinking a bit, a few years ago I mounted a 35 gpm pump on the belly of an M Farmall and drove it off the belt pulley hub with a double V belt drive I was starving the pump at full throttle with an inch and a quarter feed line to the pump from the tank, so by changing pulley sizes I slowed the pump down about 500 rpm and it's worked fine since. So I'll use a bigger feed line on the 4410. I'll mount the tank and valve system high on the 3pt. about the level of the weights on the bracket to keep access to the rear pto and regular drawbar. Likely the pump will have to be under the tractor being I never take the loader off. Grandma and I have a few Grandkids to visit yet before school starts up, so likely I won't get much shop time in for a couple weeks. However it turns out I'l post a picture of two. Frank.